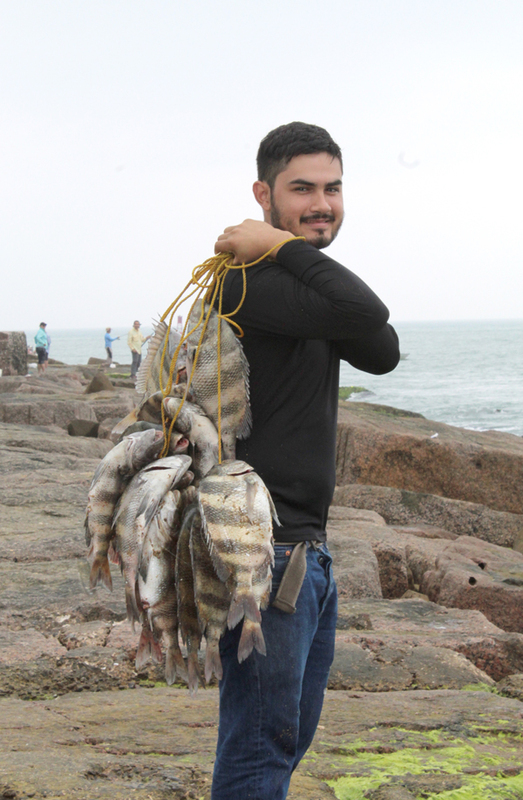 Daniel Leal of Brownsville shows his prized catch. The annual sheepshead run is pretty much over but anglers still have a chance to catch this fish plus other species like Spanish mackerel, jack crevalle, speckled trout and whiting. Many of the anglers who come from all over the Rio Grande Valley, said they caught their limits while the sheepsheads were in full run and still are hooking this feisty fish. 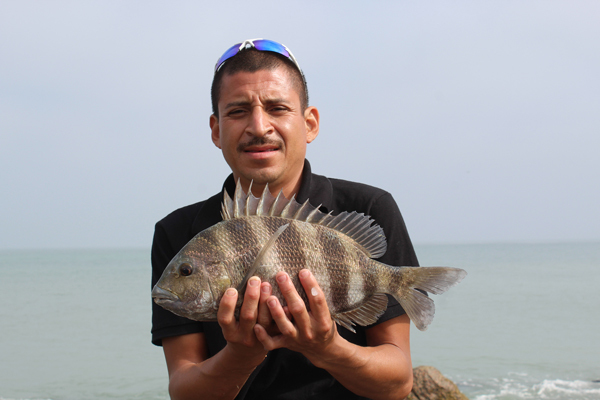 Among those catching their limits include Adbiel Araguz, a veteran fisherman from Weslaco. Others, like Daniel Leal of Brownsville, are newcomers. Several dozen anglers could be seen on the tip of the jetties pulling one fish after another while others were walking back with their five-fish limits on their backs or inside five gallon buckets. Edinburg resident Luis Diaz said he fishes about five times a month. The 35 year old man said he started fishing at 14 and catching sheepsheads is one of his favorite pastimes this time of year. Meanwhile, a group of Winter Texans from the Midwest regions of the United States tried their chances before heading home. He said they usually fish the bay off a pontoon but, since the vessel is out of commission right now, they tried something different. Johnson said they like to fry the fish they catch making fish nuggets just like they do with chicken. The sheepsheads run started a little earlier this year as they generally arrive here in huge numbers by the first week of March but changes in weather patterns have made things somewhat different than in years past. Now is jack crevalle and other species time.